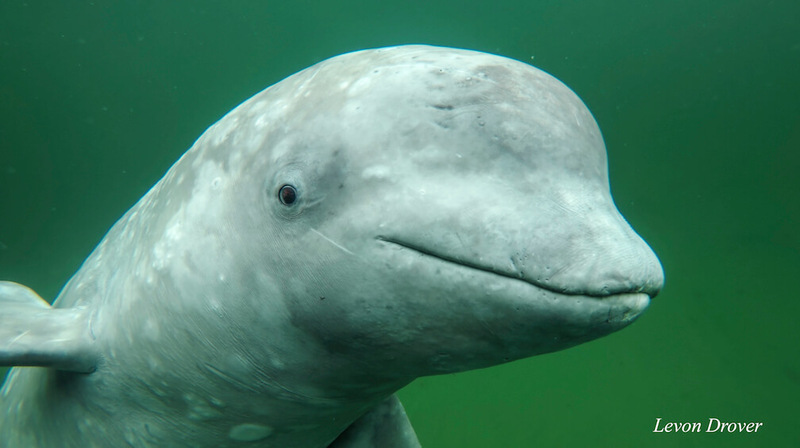 How would you like to “see” the world the same way a dolphin, a beluga or a sperm whale does? Marine ecologist and geneticist Andrew Thaler has recently invented a pair of glasses and headphones that transmit vibrations to the jaw to allow users to perceive their environment just like a toothed whale would. Toothed whales – including dolphins and at least 65 other species – as well as bats, locate and identify important elements of their environment (such as prey, other members of their species, obstacles, etc.) by emitting clicks and capturing the echo produced when the sound strikes an object. This is known as echolocation. Clicks are produced by an anatomical structure located in the head of toothed whales called phonic lips or monkey lips. The sound then moves through the melon (the part of the head filled with acoustic fat that allows the sound to be concentrated) and then emanates from the forehead. The clicks emitted bounce off objects in the ocean and return to the whale, which captures them, not with external ears like our own, but with its lower jaw. The toothed whale “hears” with its jaw, which contains the same type of acoustic fat that is present in its melon. The sound waves then travel from the jaw to the inner ear, allowing the whale to translate this information into spatial awareness. Humans can also hear through bone conduction, that is to say the propagation of sound to the inner ear via the skull or jaw bones. A number of listening devices, including sports headphones and hearing aids, make use of bone conduction. To “see” the way a whale does, Andrew Thaler combined headphones that use bone conduction in the jaw to a lidar (Light Detection and Ranging) module, an instrument for detecting and estimating the distance of an object using light. The system uses light waves (infrared in this case) to detect the presence of objects, rather than sound waves like whales use. He connected this system to Arduino, a microcontroller used to create interactive objects, and attached all this to a pair of glasses. And DolphinView was born! Andrew tested DolphinView in a park near his home. “Having full hearing plus a constant drum beat of clicks alerting me to the closeness of whatever object was directly ahead of me was a bit surreal and it took a while to get used to the sensory overload,” he says on his website Southern Fried Science. However, “Walking around, you definitely do start building up a sense of what all the clicks mean, and with a little practice, you can easily pick out thinks like open doorways with your eyes closed,” he adds. DolphinView allows users to experience a simplified version of echolocation. We do not know exactly what toothed whales “see” when they project sounds on complex objects, but studies have shown that they are able to perceive the thickness and the distance of objects. According to Andrew Thaler,building this tool is simpler than one might think. From design to completion, it took less than two days and the entire device was built for under $100. Documentation is available free of cost on GitHuband Thingiverse. Everything is open code and ready to build. A fun project for next weekend, perhaps? After several years abroad, where she worked on resource conservation, species at risk and climate change, Béatrice Riché is back on the shores of the St. Lawrence River, which she keeps watch over every day. As editor for the GREMM since 2016, she writes columns on whales with inspiration from events that take place here and afar.